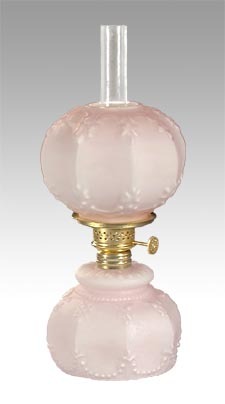 Embossed Beads & Fleur-de-lis miniature oil lamp shown in satin pink over opal cased glass, 9 7/8" tall. Never leave a burning oil lamp unattended. Only use pure kerosene lamp oil fuel. No reviews yet for the Miniature Beads & Fleur-de-lis Lamp.